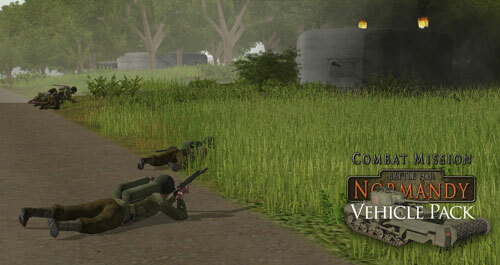 Vehicle Pack for Combat Mission Battle for Normandy brings some interesting oddball vehicles to the Western Front environment. From the rather obscure Halftrack U304(f) repurposed French halftrack to the more famous Churchill Crocodile there's plenty of fun in this Pack. 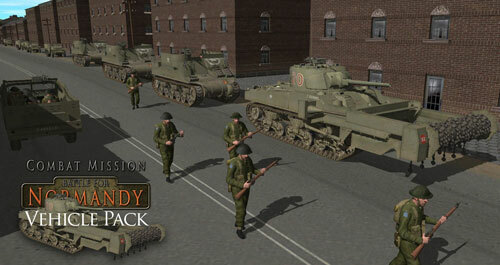 Unlike most other expansions, Battle Pack 1 for CMBN requires both of the previous Module expansions (Commonwealth Forces and Market Garden) for full functionality of the content. Game Engine 3 or higher is also required. Included in this Pack are 19 new vehicles, 5 AT Bunkers, and 3 Backpack Flamethrowers. Some vehicles have new capabilities, such as clearing mines or throwing flame, others use traditional methods of destroying things.